Very pretty and tastefully finished home. It will be a lovely canvas to decorate. I like the openness and clean color scheme. The stairs are such that one could actually get up in the middle of the night and not injure oneself on the way to the loo. The red cottage door is very welcoming. 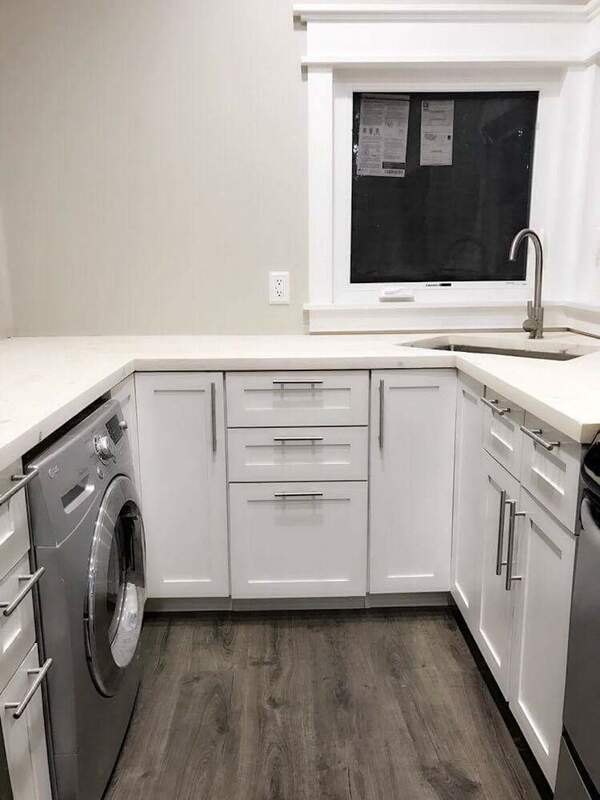 I think I would advise that a hood be added to the range and possibly a 12″ wide cabinet adjacent to add space and disguise the lack of base behind the range. Also add some upper cabinets or open shelves adjacent to the refrigerator. Without the hood the house will be filled with sticky grease fumes that will stick to everything and go rancid. The smooth grey walls are visually satisfying but, if they are as they appear gypsum board. The flexing inherent to a two axle trailer will destroy the lovely smooth work at the joints and pop nailheads thruout. Sheetrock doesn’t travel well without some allowance for movement. 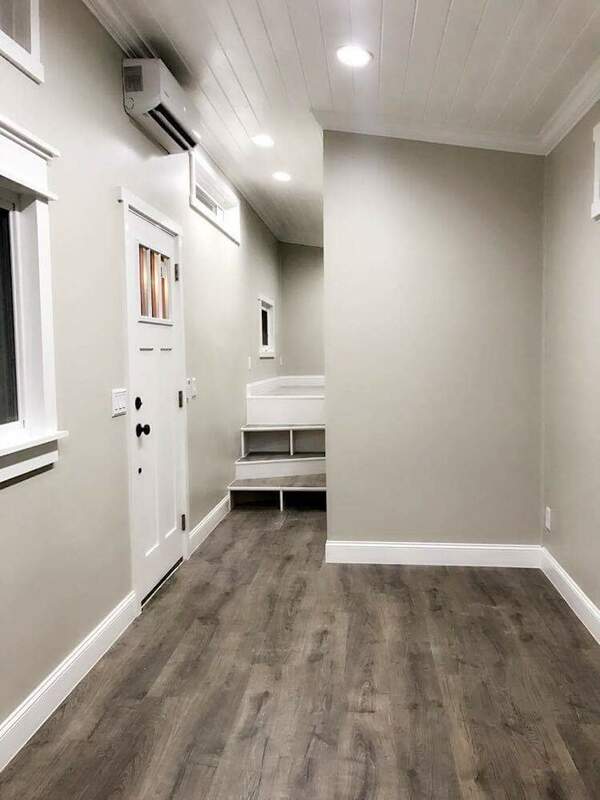 This house has some nice features like the loft you can stand in, but it could use a little bit more style. I have to agree with SC about the lack of style. I do like the built-in stairs leading up to the loft, which is a great touch, but other than that, it leaves me feeling cold and bereft. 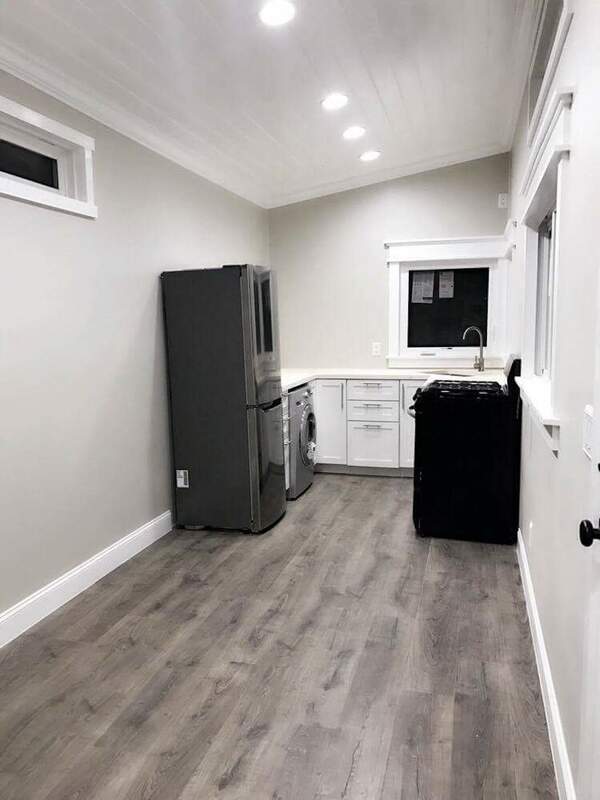 A little decorating and staging would certainly help the style issue – – but – – why did they cram the kitchen into such a small space?? 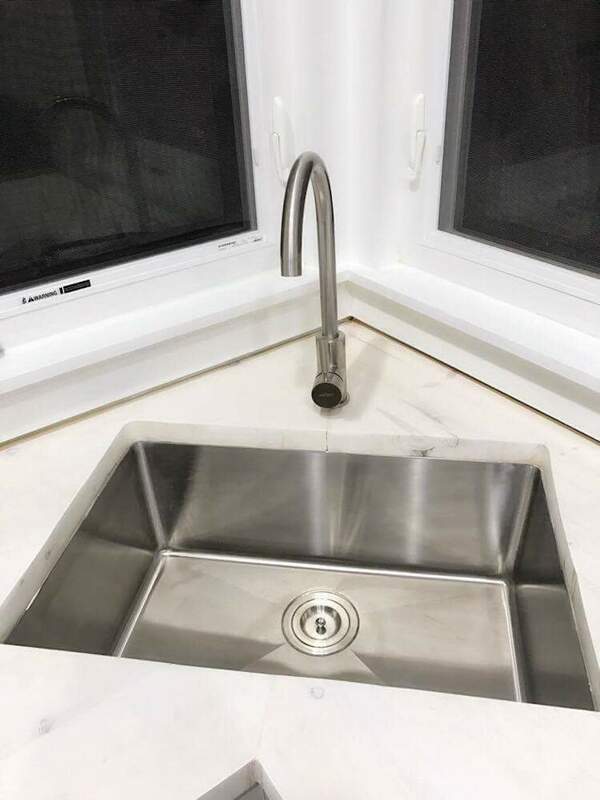 with that awkward sink location and the bad countertop seam. They coulda given it another foot or so. I do like the overall idea though. And the bedroom is gr8! As an older person, I really appreciate that this house does not have a ladder to climb up. That is a great bedroom. I believe that it is only meant to be a shell for one to put their own stamp on with built ins,etc. 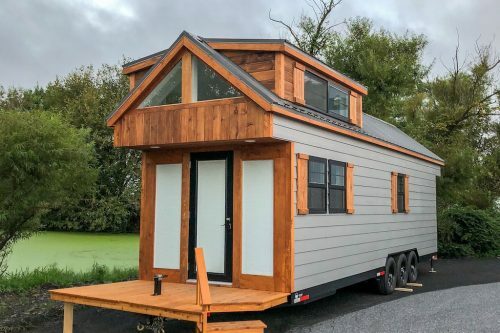 That being said, a lot more could be done with the door and windows. French or a single glass front door alone would do a lot for this place. It’s interior decoration that gives a place style and this hasn’t been decorated yet. 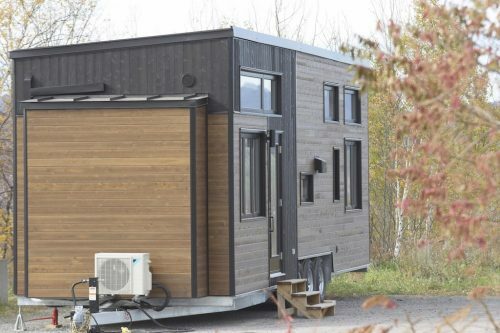 Personally the kitchen size is just right. I don’t want to waste precious space on cooking. I’d rather have comfy furniture and there is plenty of room for that. 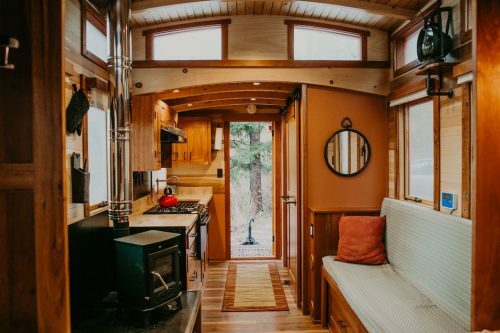 I would take a compact kitchen for more living space any day, but the finishes on this could be nicer. The seams and caulking on the sink and countertop are subpar. 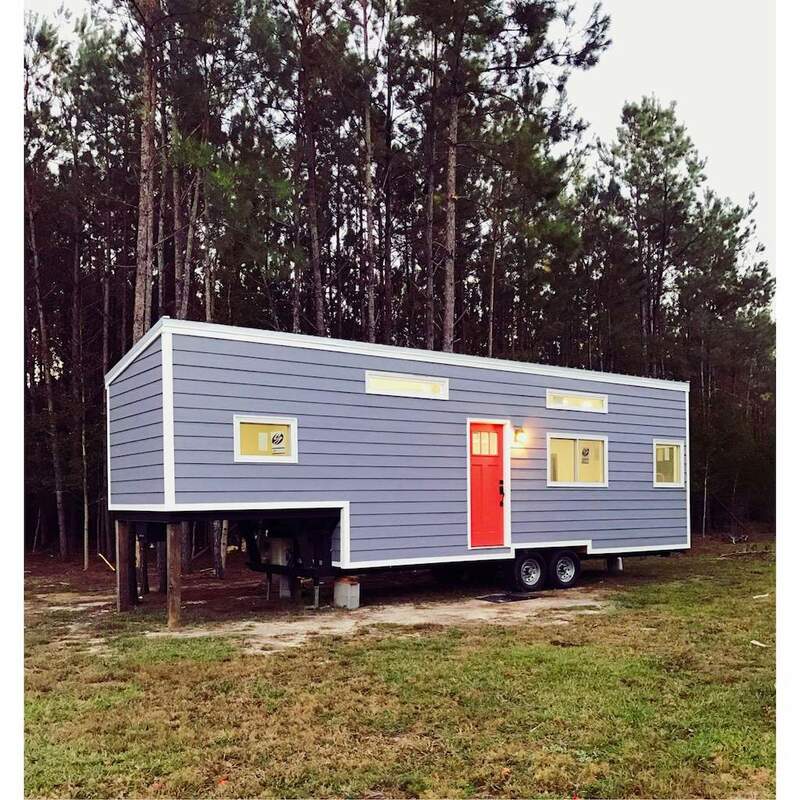 Alot of tiny houses look super high end with filters on the pics but you can see chunks and paint issues when you look close on this one. Curious about the intended use of this unit with the pole mounts on the front. Permanent guest house? Rental? Would like to see once finished. 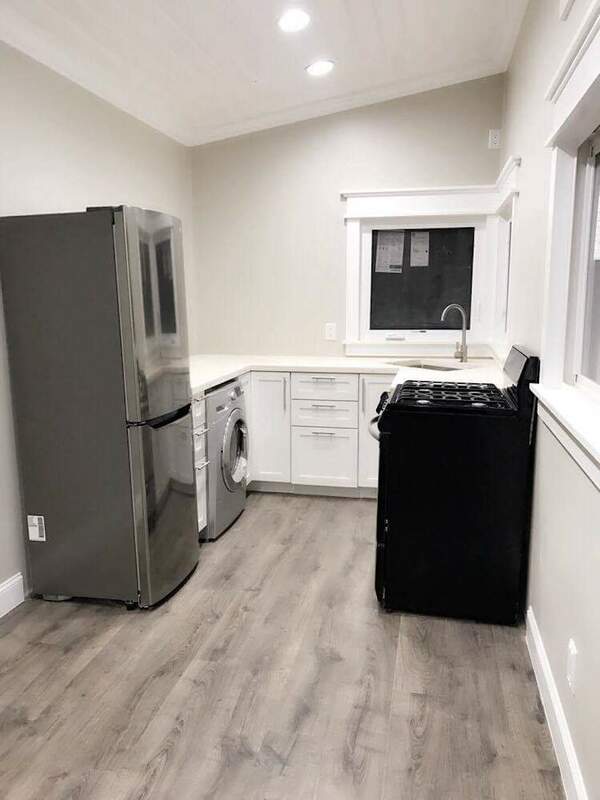 I don’t like the awkward placement of the sink or the fact that the washer is in the kitchen. More counter space! 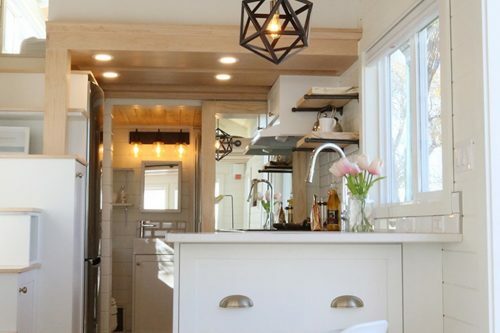 I agree – wall cabinets w/some open shelving in the kitchen, all around – and definitely a range hood. So the countertop chipped – it happens – but fix it! Epoxy the ‘vacancy’ & the seam, don’t just leave it. 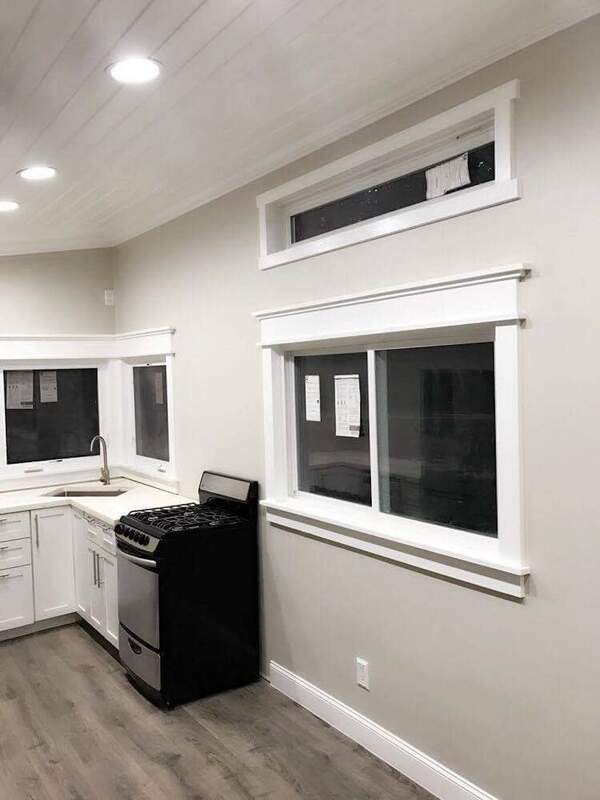 I’m more concerned about the lack of caulking around the whole countertop, especially under the windows at the sink. Serious problems could result. I don’t like ANY door cabinets on the bottom. Keep the corner roundabouts, but only drawers on the bottom!! There’s not enough room to get down on the floor to pull out things stored in the back – or not having a back that will let you lol. Find room in the bathroom for the washerdryer/stackable – even if sacrificing a little bit of the livingroom. I would move the front door to the stairs so there is more wall space in the “livingroom” for a TV. Speaking of stairs – what’s with the different heights? 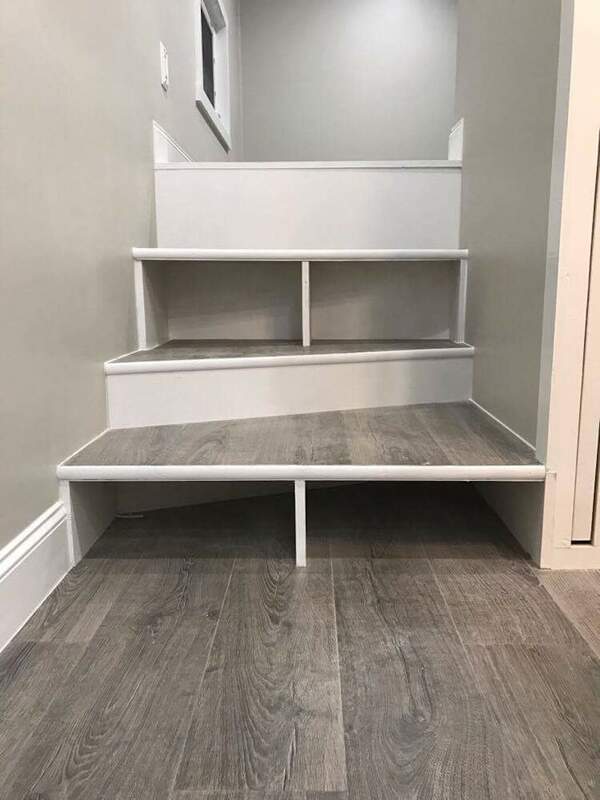 Just make them regular, straight across stairs, but the same height. Not rocket science. I don’t mind the color. If I was buying this, I would appreciate not having the decorating done for me. I would put a 1×10 over the kitchen windows for display; I would have ‘hook&pulley’ assy at each upper window for plants; no end tables for lights (invites clutter) instead use decorative hanging lights or the ’70’s arching ones; etc. I actually prefer less windows because I need wallspace for artwork – but also loving plants, so I would put in 3-5 skylights (2 operable: BR & Kitch) for maximum air & light. Everyone has room for their own ideas to make it a lovely “cottage”. It’s a beautiful design & w/some tweaking would be wonderful. This is one of my favorites. Staircase bugs me not one the same! Not code. And the Caulking is awful. Same goes for the dirt collecting gap by the sink.Why would you Caulk in white with a black threshold ,at the front door?$3 for a small tube of black. Nice Unit just a little more attention to detail.